In brisk, bracing prose, a freelance historian follows England’s first Queen Elizabeth from birth to the early days of her reign. Starkey (Henry VIII, not reviewed) develops the thesis that among the young queen’s principal virtues was “a sort of humanity” that distinguished her from most of her predecessors, including her own sister, “Bloody Mary” Tudor (who burned 300 religious opponents at the stake during her short reign). 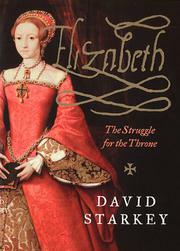 Starkey believes Elizabeth’s early life should read like “a historical thriller” and, at least until the final chapters (which focus on religion), succeeds admirably in breathing fresh life into one of England’s most overstudied monarchs. Unconventionally brief chapters (one consumes less than a page) explore Elizabeth’s family background and rise to the throne. Starkey sprints through the life and loves of her father, Henry VIII, consigning poor Cardinal Wolsey to a mere prepositional phrase and gliding through the fates of wives four through six in barely a page. Elizabeth, Starkey demonstrates, was an “infant phenomenon,” mastering Latin, French, and Italian (her Greek was less impressive), while absorbing vital lessons from the political intrigues swirling around her. After her father’s death and her consumptive half-brother Edward VI’s brief reign, sister Mary became queen, reestablished Catholicism as the religion of the land, married an unpopular Spaniard, failed to deliver an heir, and died miserably. Arguably Mary’s principal legacy was her decision to arrest rather than execute Elizabeth, who was patently a participant in several failed attempts to seize power. “The Tower made a good classroom,” quips Starkey, ending this fluid biography with the observation that Elizabeth’s decision to both hire and heed capable advisers was “crucial to the success of [her] government.” Alluding to Adrian Mole and Goldilocks, freely employing clichés (“like a duck to water”), and cracking wise (a “rolling stone gathers dross”), Starkey pens a light, even frisky historical narrative.